If you follow me on Instagram @quitealooker, you probably saw that a few weeks ago I went to Montreux and the Swiss riviera for a weekend. I won an Instagram contest back in May, organized by Heineken and Ryanair, where the prize was to spend a weekend in Montreux, attending two of the final concerts from the world famous jazz festival that takes place there. First of all, let me tell you how happy and surprised I was that I won – I had never ever won anything in a contest, so that was one of the main reasons why I was super excited. And of course, the prize itself was really cool! I participated mainly because of my dad, who is really into jazz and I have always wanted to surprise him with a trip to Montreux during the summer. Here’s a brief overview of how we spent our weekend in the lovely Swiss riviera! We travelled to Geneva on Friday morning (my dad from Sofia and I from Amsterdam) and arrived around 11, then took a train to Montreux straight from the airport that took about an hour. The scenery from the train was amazing! On the right side you could see the Geneva lake and on the left between Lausanne and Montreux were the world famous UNESCO heritage Lavaux vineyard terraces. In Montreux we stayed in a very cute hotel (Golf Hotel René Capt) with an amazing view over the lake! I liked the fact that it was a bit away from the “centre” and the crowds at night as it got quite noisy at the late hours. I mean the town itself was pretty small which was perfect if you would like to walk around and manage most of the distances by foot. For the rest, you get a free Montreux Riviera card from your hotel that offers free public transport for the region of Montreux and Vevey and a lot of discounts for additional activities. One thing we did was to take a round cruise across the lake with a 50% discount but we unfortunately we didn’t have the time to visit some of the museums as well as the famous Château de Chillon™, where the same discount can be applied. Probably the best experience for us was to go up the mountains, which offered an amazing view over Montreux, the riviera and the lake! We hiked for a bit then we took a few of the cute mountain trains and let me tell you, the real beauty of Switzerland really lies in the mountains! We didn’t manage to get super high but it was still so beautiful, especially on a sunny summer day. We went off at station Caux and went to visit the Caux Palace, where we got to know more about its history and it’s current role as a world conference center. The view from this palace over the lake was really breathtaking! Unfortunately, as I told you we didn’t have enough time but I would have loved to go and explore even further in the mountains outside of the Montreux region as everything seemed so peaceful and beautiful. 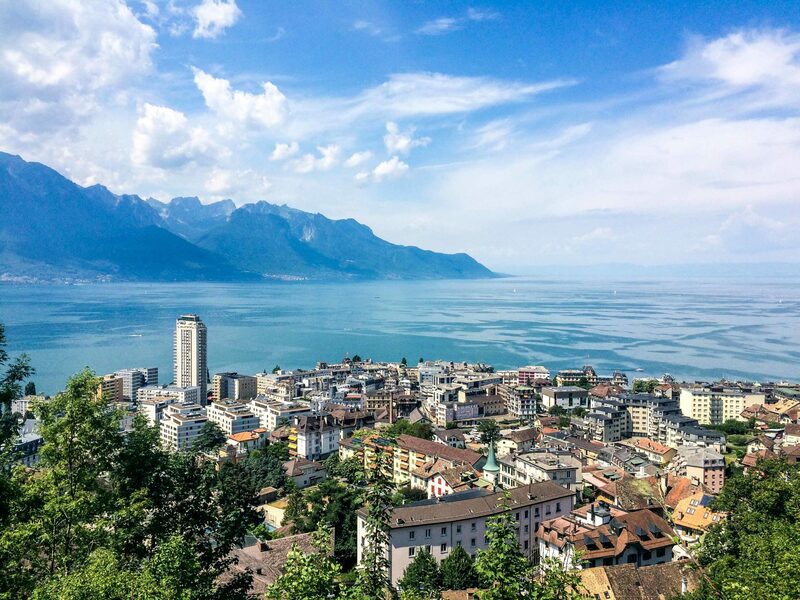 When we took the boat cruise, we decided to take off in Vevey, the town just next to Montreux, which is more famous as the region where Nestlé comes from! The town is a bit different from Montreux both in terms of architecture and vibe – I felt it was much more French and the atmosphere was calmer, which I liked better. Almost every building had beautiful iron balcony railings and flowers attached to them! There were green parks just next to the lake and many beaches and places for swimming. Some interesting places that are worth visiting are Nest, which is an interactive museum that shows the story of Nestlé and the Alimentarium, which is a food museum (OMG!) with an amazing garden. As I said, we went to Montreux for the last two days of the Montreux Jazz Festival, which usually lasts more than a month, hosting world famous artists, bands, DJs and so on. The vibe in the city was definitely super artistic as there were tons of events happening every day from the afternoon till the early hours of the morning. We attended two of the main concerts in the Auditorium Stravinski: Imelda May & Jamie Cullum on the 13th and Jamiroquai on the 14th. We really liked Jamie Cullum even though we hadn’t heard of him before but he really put his heart and soul into the performance. My dad and I are both big fans of Jamiroquai and were super excited to see them live but we ended up a bit disappointed because of some technical details – we were on the balcony and the lights from the stage were constantly blinding us, which resulted in most people upstairs to leave the concert… And the sound was a bit too loud if you ask me.. But nevertheless, I enjoyed the performance and am glad that I attended this festival! On the last day, we checked out after breakfast and decided to spend a few hours exploring Geneva before our flight in the afternoon. We walked around the lake, saw the Jet d’Eau fountain and the old part of the city which was super cute! Unfortunately, as it was Sunday most of the shops and restaurants were closed but the city was really peaceful and perfect for a walk!